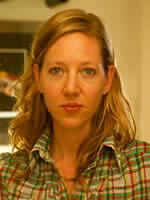 Maggie Nelson reads two long poems, “The Mute Story of November” and “The Halo Over the Hospital,” from her book Something Bright, Then Holes (Soft Skull Press, 2007). In a brief introduction, Nelson gives credit for the title of her book to Annie Dillard, whose essay “Seeing” refers to Marius van Senden’s 1932 Space and Sight, about previously blind persons returned to sight. Thank you for sharing the poetry reading of this wonderful poet. My heart bled through most of the hospital poem written for her friend. Maggie’s poems are deliciously painful, raw and gorgeous in its respect for the music of language. Again, thank you for sharing.